Interesting to note here that "the utmost corners" really means… ‘Having the hair shaven (or clipped) in angles,’ that is… having the beard on the cheek narrowed or cut: a Canaanite custom, that is forbidden to the Israelites (Leviticus 19:27; 21:5). The Arabs are here referred to, in relation to, those ‘that dwell in the wilderness.’" See also Jeremiah 25:23; 49:32. These Arabs are desert people that live in Dedan, Tema Buz. These Arabs cut their beards in a certain way… in the shape of the moon, since Allah is the moon god, and this ritual originates from moon worship… All these nations are the ‘sons of Ishmael’ and are the nations going though these massive changes right now. Judgment against Dedan and Tema is mentioned in conjunction with the judgment on Edom in Jeremiah 47:7-8; Isaiah 21:13-17. For centuries, people known as Sheba and Dedan were a wandering people, migrating back and forth through the desert wastes of Arabia. Their origins are ancient. The Arabian culture began with a long journey eastward. They ranged eastward to the Persian Gulf, northward to ancient Persia and Assyria and south-westward across the Sinai Peninsula to Egypt. They became experts at surviving in the desert, as nomadic traders whose lives were built around a few village oases that were sprinkled across trackless wastes. They lived by the sword, defending their trade routes and caravans from competing tribes. To this day, that is their mentality! They are shrewd traders who twist the truth, when necessary to complete a business deal. A remarkable Psalm brings this fact into focus … from Israel’s point of view: "In my distress I called to the LORD, and he answered me. Deliver me, O LORD, from lying lips, from a deceitful tongue. What shall be given to you, and what more shall be done to you, you deceitful tongue? A warrior's sharp arrows, with glowing coals of the broom tree! Woe to me that I sojourn in Meshech; that I dwell among the tents of Kedar! Too long have I had my dwelling among those who hate peace - I am for peace, but when I speak, they are for war!" (Psalm 120) The seven verses of this Psalm are a precise and heart-rending expression of the awful truth. The word "Mesech" has precisely the same Hebrew spelling as "Meshech" in Ezekiel 38. In other words, it is the spectre of Russia that is invoked here. This Psalm is Israel’s lament that Russia and Islam are wholly given over to war… They lie with impunity and bare their weapons for the purpose of forcing foreign policy… But in the end, Islam will turn against itself, as the Russian alliance charges south. Sheba and Dedan seem best described by the United Arab Emirates, Qatar, Kuwait, Saudi Arabia and a few other Arabian partners. Because of their commitments to the U.S. over the last seventy years, they continue to side with the West. To the contrary, other Islamic factions have already aligned themselves with Russia, making Islam a house divided. When Russia is finally dragged into the Middle East on a full-scale basis (Ezekiel 39:3-6), the illusion of Islam as a united force will be shattered. Israel will emerge as the victor! The alliance among Syria, Iran and Hezbollah took shape in the 1990s… despite several attempts to fracture it has so far proven to be resilient… The alliance is frowned upon by many Arab countries, which describe it as sectarian and accuse the two countries and Hezbollah of looking to form a "Shiite crescent," comprising Middle East countries – Lebanon, Syria, Iraq and Iran – where the majority of people are Shiite or where there is a sizeable Shiite minority. Iran, Syria and Hezbollah have long refuted the accusations, saying their alliance is solely meant to destroy Israel and support the rights and interests of the Palestinians. Russia… is considered one of the staunchest supporters of Assad’s regime and the relationship between Russia and Syria has been solid since the early days of the Cold War… During the Cold War, Russia aided in propping Syria up militarily in an effort to put American influence and expansion in check in the Mediterranean and through the rest of the Arab world while sustaining its own. In those days, the Soviet Union armed Syria against their enemies but also established a heavy Communist presence in Syria itself. As a result of the Russo-Syrian relationship, Russia maintains a naval presence in the city of Tartus and works cooperatively with the Syrian military. Russia has sent S-300 missiles to Iran in September, and Israel's red line has been crossed! With a weakened US President, the events of Ezekiel 38/39 are speeding up. Russia knows it is likely that the United States will not back Israel, and Israel will be all alone. Iran and Russia are using the weakness of the United States to push against Israel. In time, Turkey, Libya, and Sudan will join the alliance in the attempt to destroy Israel. The US has fallen so far so fast… and Israel's great protector is decreasing rapidly. In this loss of a protector, Israel will realize during the Ezekiel Gog/Magog War its great protector all along was Jesus Christ. It was Yeshua (Jesus) who was there during the burning bush, it was Yeshua who was there listening to the cries of Israel, it was Jesus who was there with Daniel's three friends in the fiery furnace, and it will be Yeshua who will protect Israel during the Ezekiel War. Yeshua (Jesus) is also there for you… It takes a great time of crisis for a nation or a person to realize who the Lord is. In time Israel will too! Look for Obama to wriggle out from his duties as protector of Israel, which in turn will further emboldened Russia and Iran. We believe the plans have been made for some time to attempt to destroy Israel. Iran is ready now, but it will take an event to bring Russia into the battle. We believe the Ezekiel Gog/Magog War may even happen in Obama's presidency… but we believe that time will tell if this assumption will be true. We must still look at the destruction of Damascus as a possible hook for Russia, and we do not ever need to deny anything that could be a hook. The S-300's is a major move, Israel's red line, but no United States to protect Israel is fatal to her existence, unless there is a God, which we know is true. It may be time for God to step in. Where is Syria in the Bible? And what is her future before the Coming of Yeshua, the Lord Jesus? Once upon a long time ago, the Hebrew prophet Isaiah predicted that the Syrian capital city of Damascus would someday cease to exist. Isaiah, whose prophetic ministry spanned between 740 – 701 BC declared that it would be reduced to rubble. Some scholars believe this prophecy found fulfilment around 732 BC, shortly after Isaiah presaged it, when the Assyrians conquered Aram (the ancient name for much of modern day Syria). But, if it was fulfilled then, why did Jeremiah predict a similar scenario over a century later? And, why did Isaiah mention Assyria 37 times throughout his 66 chapters, but never once mention it in Isaiah 17. For instance Isaiah 8:3-7 clearly identifies an Assyrian conquest of Damascus. 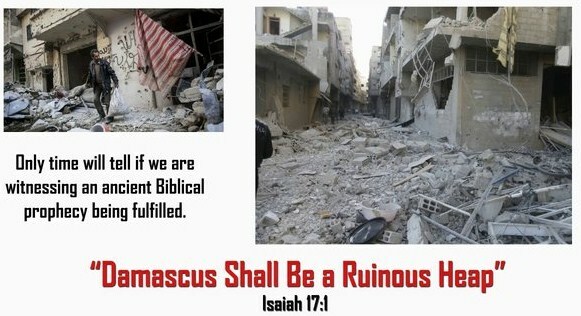 This found fulfilment in Isaiah’s lifetime, but Damascus still exists today! The relevant passages concerning the future of Damascus are located in Isaiah 17:1-14 and Jeremiah 49:23-27. 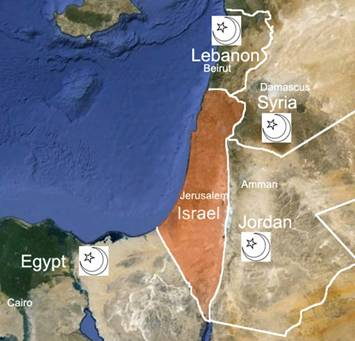 We also know from the Bible that there will be regional wars, such as the one described in Psalm 83 where all of Israel's abutting neighbours and the terrorist groups existing in those nations attack Israel… Or the Gog Magog war described in Ezekiel 37-38 where Russia, Turkey, Iran and others also attack Israel… Or the one in Isaiah 17 where Damascus is destroyed and Syria's environs are made a waste … Or the LORD'S promise to Israel/Judah that they will finally possess Jordan in the last days just before He comes back to establish His Kingdom (Obadiah 15-21). Many people don’t realize that the current war within and against Syria, did not just happen today… it had its roots in 2010 in the so-called "Arab Spring!" On January 28, 2011… in the north-east Syrian city of Al-Hasakah a man named Hasan Ali Akleh soaked himself with gasoline and set himself alight…! It was in the same manner reminiscent to how Tunisian Mohamed Bouazizi did on 17th December, 2010. Mohamed Bouazizi’s self-sacrifice is seen by many in retrospect… as "the spark that ignited the Arab Spring." Similarly Hasan Akleh’s action was seen as "a protest against the Syrian government," and in a similar way sparked the ongoing Syrian struggle. A "Day of Rage" was called in early February 2011, from social media websites, Syrians took to the streets and to hold demonstrations. Security was increased across the country. However plans to arrange this "Day of Rage" ended in failure. Al Jazeera in a report back then described the country as "a kingdom of silence," stating that the strict security measures taken in Syria along with the popularity of President Assad was the reason. The same article quoted Assad as stating that his country was "immune" from the kind of democratic insurrections that toppled the dictators of Tunisia and Egypt respectively. The Syrians are still rebelling as they are tired of the iron fisted rule over them, and want so-called democracy. The problem is that their version of democracy is NOT the same as the West’s version of democracy. Always, in these areas Islamic rulers and dictators… always seem to take over, and instead of freedom, more of the same oppressive tactics are used to rule over a people. With the terrorist groups operating out of Damascus building up arms caches on the border of Israel in anticipation of another war in the near future, it may not be long before this prophecy from Isaiah 17 becomes history. Recent news headlines have shown that the Syrian government, led by Syrian President Bashar Assad, had moved the official state archives out of Damascus in an effort to protect them from an anticipated attack by Israel. It has been reported that Syria was expecting some sort of nuclear attack as the result of a conflict with Israel. So with defence pacts being made between Syria and the terrorist organizations on the borders of Israel, it is not hard to see how this prophecy in Isaiah 17 could become fulfilled in the near term prophetic future. 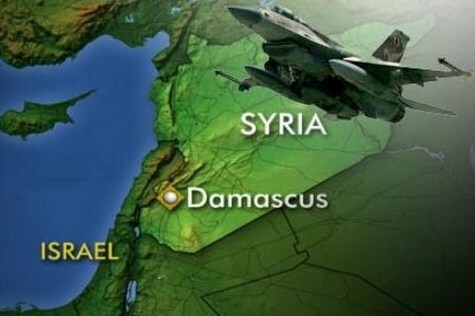 Syria has played a steady role as an enemy of Israel… If indeed Damascus is pulled into a future conflict it is possible that another prophecy from Amos 1:3 might also indicate that Damascus’' time has run out. With Syria taking part in the wars of 1948, 1967, and 1973… it is not unreasonable to believe that Damascus could finally receive the punishment foretold by the Bible. Despite the certainty of the Lord’s word against Damascus, we believe that we would all do well to pray for the innocent people who will be caught up in this terrible situation. Syria’s long history of anti-Semitism will finally lead Damascus to its fatal fate per Isaiah 17 and the words of the prophet Amos. The Imams and the Mullah's in Syria continually say that the Jews descend from apes and pigs, and that they are not the people of the Lord. What about Iran… who is allied with Syria? People today are of the mindset that the events of the Old and New Testaments all happened back in the "Biblical days" of human history. They fail to grasp the awesome truth that we are still living in the Biblical days. They never ended. What will yet happen on the face of this Earth in the years to come has already been prophesied and penned in the Bible. There remain things written in the Bible, in both the New an Old Testaments that are yet to come to pass. Prophetically speaking, we are living today on the far side of the valley, time wise, and quickly moving up the mountain slope towards the coming of the Antichrist and the great Day of the Lord; the end times of God's dealing with the Jews, His chosen people. Although 1948, the year when Israel became a State, would seem a natural benchmark for the start of the latter times of Biblical days, we believe a much better benchmark emerged in 1979 when the Iranian Revolution catapulted the land of ancient Persia back onto the global political stage. The Iranian Revolution inspired an exponential rise of Islamic fundamentalist sentiment against the West; an angry wind that began to blow with increasing velocity across the Middle east and the larger Islamic world. When the Islamic world saw that Iran could blatantly snub its nose at the powerful West, and get away with it, others quickly followed. The subsequent Iran/Iraq war, the rise of Al Qaeda and Osama Bin Laden, the attack on New York on September 11, 2001, the Gulf Wars and the wars in Afghanistan and Pakistan all directly or indirectly precipitated from this seminal event. The Arab Spring uprisings in North Africa and the Middle East and the increase in sectarian strife between Sunni and Shiite Islamic factions across the Muslim world are all part of this equation… and Iran is an active political driving force in this phenomenon. Iran is Biblical Persia and, in retrospect, we can now see that the emergence of Iran as a world power, and a modern-day growing global threat, is prophesized in the Book of Daniel. The prophetic seal on the Book of Daniel is unsealing right before our very eyes. The Church Age is rapidly drawing to a close. The Old Persian Empire encompassed the areas of present-day… Iraq, Iran, Syria, Kuwait, Afghanistan and Pakistan and also occupied-present day Turkey, Palestine, northern Egypt and Libya around 500 BC. The Persian Empire figured most prominently in the captivity of Israel in Biblical history and, as we shall point out, Persia also figures prominently in future prophecy and the beginning of the "latter days" (Daniel 10:14). It is no coincidence that the Middle East is a powder keg, awaiting only the proper spark to explode; it is no coincidence that radical Islam has become the global terror threat; it is no coincidence that Iran is threatening to wipe the nation of Israel off the map; and it is no coincidence that Israel exists as a nation, once again back in most of the very same Biblical lands that God promised Abraham thousands of years ago. None of this is coincidence; it is the fulfilling and unfolding of God’s Words and setting of the stage for the fulfilment of the coming events written about in the Book of Revelation. First of all, the Lord God reiterates that this is an END TIMES prophecy; a yet future event. Then the Lord God identifies the two horns of the ram as the kings of "Media and Persia" which would roughly indicate the land area from eastern Turkey and Iraq into Iran and eastward into Afghanistan and Pakistan. It is no coincidence that the conflicts in these lands are the current focal points of the daily news. Politically speaking, Syria is currently siding with the Iranians and their Hezbollah allies against Israel. Turkey, which used to be an ally of Israel, is now seen as sliding towards the Iranian camp. Following the pullout of U.S. forces, Iraq is unstable and is dominated by a Shiite government that is increasingly being drawn into the Iranian sphere of influence. There is a building up of fault-lines between Shiites and Sunnis in the region, most notably started by the conflict in Syria. Expect to see the unexpected in this region in the coming years. The daily news is filled with ever increasing concern about Iran's nuclear ambitions. Will Iran build a nuclear bomb…? Will they use it…? Will the Israelis pre-emptively attack in an attempt to stop them…? The major western powers (the U.S.A. and Europe) are currently working to pressure Iran to cease nuclear fuel production through economic sanctions. The Russians and China, who derive wealth and commerce resources from doing business with Iran, are resisting such economic sanctions. Meanwhile, the rulers of the Iranian government, a hard line Islamic regime that has publicly declared it is… "hell-bent on destroying the nation of Israel," will not stop their march towards development of nuclear weapons. Diplomatic efforts will eventually fail. There is a nuclear showdown approaching between Middle Eastern and Western civilizations. During September 2013 with the Syrian crisis, for the first time, Israel deployed an anti-missile battery in Jerusalem. We believe two reasons can be given why this happened. First, Israel knows the military capabilities of its enemies can now reach Jerusalem, the heart of Israel. Second, Israel does not trust the West’s negotiations over Syria and their ability to contain the violence in Syria. The pressure of the region is more than it has been in recent memory. This situation is as fluid as it has ever been, and Jerusalem is becoming the centre of it all. It’s always been… and still is about Jerusalem… and the Land of Israel. There was and will always be tensions with Israel with the countries surrounding Israel …! Understanding the complex situation in the Middle East is not easy for the West…! Here the mindset is simply not the same. In the Middle East the very sign of weakness is not respected and seen as cowardice! Today the US and the West is continually speaking about taking action against Syria or other nations such as Libya but never acting upon what they say and this is simply not respected by Islamic nations who are willing to die for their cause. With Israel being a Jewish nation and (the only real democratic nation) surrounded by Islamic nations… Israel is like a "thorn in their side" and Islam will never accept "infidels" on what they term to be Muslim lands. 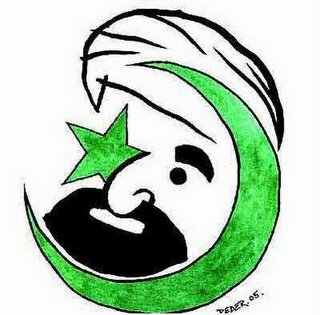 Any land that was once conquered by Islam is considered as "their" land forever according to the Quran and even though they had lost this land through war… simply cannot concede. Somewhere in the future they will try to retake it for Allah and that is why Jerusalem will always be "the most contented" piece of land on the face of the earth! The West is leaderless. We truly believe this gives more power to the enemies of Israel, and will give rise to the Antichrist. Russia's military presence has gone unheeded in the Middle East. And, China now has a presence in the Middle East. At first glance it might seem that the story of Balaam, the soothsayer, recorded in Numbers 22:25 has absolutely NO relevance today… for Israel or Bible believing Christians… During the first Exodus, as Israel prepared to enter the Promised Land, the tribes of Moab and Midian tried to stop them by asking a powerful man to intervene against Israel. They appealed to Balaam, a seer from Mesopotamia. The king of Moab wanted to stop the children of Israel from settling in the mountains of Israel… He had a plan Numbers 22:24! He would send the delegation to hire Balaam a man of great power, to curse Israel. The mountains of Israel are Judea and Samaria which today is… the so-called West Bank! The story of Balaam opens with Israel finally encamped on the border of Canaan. Their presence inspired fear in Balak, the king of Moab, whose territory bordered on the Israelites’ encampment. Apparently he viewed the Israelites as a threat to his kingdom, although they had done nothing to justify his fear. The King of Moab said to Balaam, "… I know that whom you bless is blessed, and he whom you curse is cursed." (Numbers 22:6) The king reasoned that, if Balaam would curse Israel, Moab might beat them in battle and drive them out of the land. BUT, the king did not realize that it was the Lord that was bringing Israel into the Holy Land. In trying to stop the return of Israel, the King of Moab was opposing the Lord! When Balaam left his country to meet the king of Moab, the Lord’s anger was aroused. The angel of the Lord with a large sword in his hand blocked Balaam’s path. 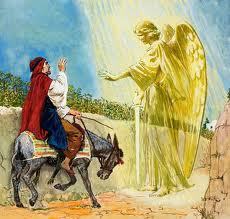 Balaam did not see the angel of the Lord, but when Balaam’s donkey saw the angel he walked off the path. Balaam struck the donkey! Then the angel of the Lord stood in a narrow place in the road with a wall on both sides. The donkey pushed herself against the wall, crushing Balaam’s foot. Balaam struck the donkey again. Then the angel of the Lord stood in a narrow place to pass and when the donkey saw the angel blocking her way, she laid down under Balaam. Balaam then struck the donkey a third time… The Lord opened the mouth of the donkey and she spoke and after a brief conversation with the donkey… Balaam’s eyes were opened and he saw the angel of the Lord. The Lord warned Balaam to speak only what He told him to speak. The tents of Israel stood in the valley of the land now called Jordan, across the river from Jericho. Three times, from three high mountains overlooking the valley, the king of Moab asked Balaam to curse Israel… and three times Balaam blessed them! Balaam looked into the valley where the tents of Israel stood (Numbers 24:5 – 6 and vs. 9) and said these words, "… how lovely are your tents O Jacob! 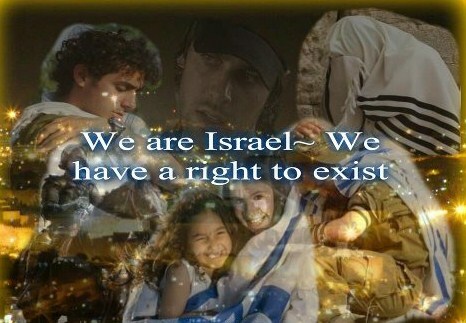 Your dwellings, O Israel! Like valleys that stretch out, like gardens by the riverside, like aloes plated by the Lord, like cedars beside the waters… blessed is he who blesses you, and cursed is he who curses you…"
Feeling unable to confront Israel in battle, Balak decided to use spiritual weapons against them. He sent some of his princes with a fee for divination in their hands…to call for Balaam to come and put a curse on Israel. As a "soothsayer" (fortune teller or witch doctor) Balaam had the reputation of uttering blessings or curses with a powerful effect for good or evil. Balaam came from Pethor in Mesopotamia. He was not an Israelite. Yet he had a direct personal knowledge of the one true God. When Balak asked him to curse Israel, he replied, "I could not go beyond the word of the LORD my God." The English form, "the LORD" (in capitals), is the accepted translation of the Hebrew sacred name of God, rendered either "Jehovah" or "Yahweh." Balaam knew God by His sacred name and called Him "my God." In Numbers 24:9 Balaam’s prophecy reveals a decisive factor in the destiny of men and nations. Speaking to Israel, he says: "Blessed is he who blesses you, and cursed is he who curses you." Individuals and nations alike determine their destiny… often without being aware of it … by their attitude to the Jews. Those who bless are blessed and those who curse are cursed! Lessons from Balaam…There are three important lessons that we need to learn from the story of Balaam: First, Almighty God has made an irrevocable commitment to establish the Jews as His people forever. Second, there is no power in the universe, human or satanic, that can ever annul this commitment. The Jews have many times been unfaithful to God, and He has brought severe judgments upon them, but their unfaithfulness can never annul God’s faithfulness. Third, it is important to see that the initiative in this proceeds from God, not from men. The phrase ‘if you want peace prepare for war’ is a famous Latin quote originally said by Vegitus. However, Napoleon Boniparte is also famous for quoting these words during the French revolution. The world has waited over 2,500 years to see the headlines we are now seeing ... think on this….! Why would Russia attack Israel in the latter days…? Ezekiel 38:13 tells us the following: "Sheba, and Dedan, and the merchants of Tarshish, with all the young lions thereof, shall say unto thee, Art thou come to take a spoil? hast thou gathered thy company to take a prey? to carry away silver and gold, to take away cattle and goods, to take a great spoil? What is the "great spoil?" Israel has discovered massive oil and gas finds off the shore of Haifa! Israel was a desert… but today it has blossomed like a rose just like the Lord predicted it would! Russia has alliances with Muslim nations bent on destroying Israel. This prophetic war between Russia, Iran and their Islamic allies against Israel has never yet taken place ... and it is very much a part of the coming "Apocalypse" and Armageddon scenario… God has been warning and preparing this generation for this coming war ... and the headlines concerning this coming war can now be found almost daily all around the world. God is trying to get our attention and to draw those who are His back to Him before it is too late. With open arms and with tears of joy God promises to welcome and to shelter and comfort ALL who will come to Him before these events take place (or before their earthly bodies die) ... yet, the Bible warns God will not mourn, nor have mercy, on those who reject and ignore and mock His Word and His warnings. God has a Prophecy line and there are events that are locked into place on this line that can not be changed. Does that mean that God causes all the Events to take place? No! But, they must take place in order for the Prophecy line to be fulfilled. Israel is under constant threat and the Middle East in constant turmoil with tensions rising daily, it would be sound advice that we all remain "watchmen on the wall" as it appears that this prophecy concerning Damascus could come to be fulfilled soon. However, only time will tell for sure when the prophecy will be fulfilled… we would be smart to keep watching Israel and the Middle East as we head towards the end of the age. The Bible says that when the end times signs come into view, to lift up your heads, for your redemption is drawing nigh! God bless you and your family always.